This is the second of our iMindMap 10 feature reveals. Our most complete edition is loaded with brand new features and useful tools to ramp up your creativity and help you get things done, fast. There’s still plenty more to look forward to, so keep checking back to discover more sneak previews of iMindMap 10.
iMindMap 10 brings you in-line access to the world’s largest Mind Map collection. 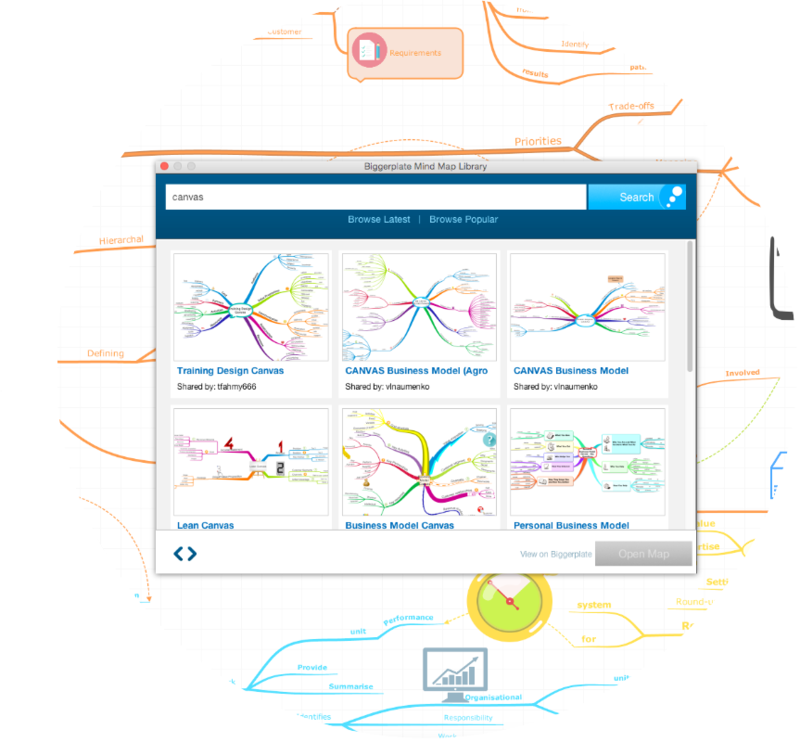 Biggerplate is a Mind Map library containing thousands of Mind Map templates and inspiring examples. Thanks to iMindMap 10’s all-new Biggerplate Mind Map Library Integration, you can now search and download thousands of Mind Map templates all from within iMindMap. Double your productivity with seamless access to time-saving templates. Find useful examples to kick-start your tasks into action – whatever your goals. If you use iMindMap at work, search for business Mind Map templates to use as a starting point for your own projects, from project planning to meeting agendas. Are you a teacher or student? Choose from the vast amount of educational Mind Maps, from curriculum and lesson plans to revision timetables. And let’s not forget your personal goals. Whether you are recording your outgoing expenses, undergoing home improvements, or planning an important event, get inspired by Biggerplate’s Mind Map collection, download a template of your choice and edit it to suit your needs. Plus, iMindMap 10 now supports files created using other Mind Mapping software*, so you can enjoy using more Mind Map templates than ever before. As always, you can inspire Mind Mappers from all over the world with your creations and put your individual stamp on the Mind Mapping community by sharing your Mind Maps to Biggerplate in just a few clicks. Stay tuned for the next feature reveal. * iMindMap 10 supports files created using iMindQ, FreeMind, ConceptDraw, MindGenius, XMind and MindManager. Don’t miss out on our exclusive iMindMap 10 launch offers that are available right now. Purchase or upgrade to iMindMap 10 now, and receive up to 60% off plus bundles of free gifts. Head to our website to find out what savings and free gifts you’re eligible for. Offers end Wednesday 21st December 2016.